Cooking by the Book. For the first time in his life, Samuel wants to try out the kitchen, he wants to prepare the first delicious meal. But, he must follow the cooking rules of the cook book he sees in years at home. The lovely big book full of yummy and delicious recipes has been standing on his shelves at home, but Samuel didn’t have the courage to take it off and to do something out of eat or simply to prepare at least the simplest meal for his family. 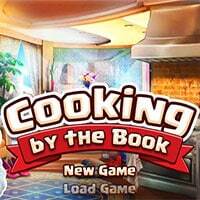 Cooking by the Book is a free online hidden object game on Hidden4Fun.